Some thermocouple readout devices produce leakage currents which can create offsets when using an IRt/c. The current originates from two sources within the device: leakage current actually generated by the input amplifier, and leakage current intentionally injected to the thermocouple circuit to detect an open circuit due to wire breaks. These currents are normally of no consequence with conventional thermocouples with resistances < 100 ohms. However, with the higher resistance of the IRt/c (~ 3 Kohms), devices with high currents will create offsets. 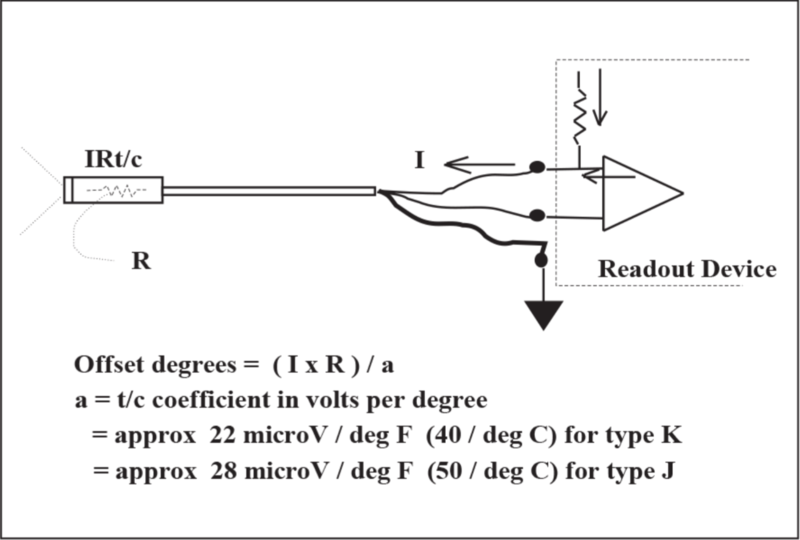 As an extreme example, a device producing 1 microamp of current will result in less than one degree offset with an ordinary t/c with 10 ohms resistance. That same device reading an IRt/c at 3 Kohms will produce an offset of the order of 100°F (55°C). Most readout devices have considerably smaller leakage currents and consequently smaller offsets. As a general rule, the smaller the offset the better, and readout devices should be chosen accordingly if other factors are equal. The offset calibration procedure presented in the IRt/c Manual is recommended for field use. For designers of readout devices, it is recommended that both sources of leakage current be reduced to 10 nanoamps or less to minimize offset errors. For recommendations on low offset readout devices contact Exergen.